The New York Mets have officially released this statement as Jenrry Mejia has tested positive for a third time violating the MLB drug rules. He is now banned for life after making the very stupid decisions. 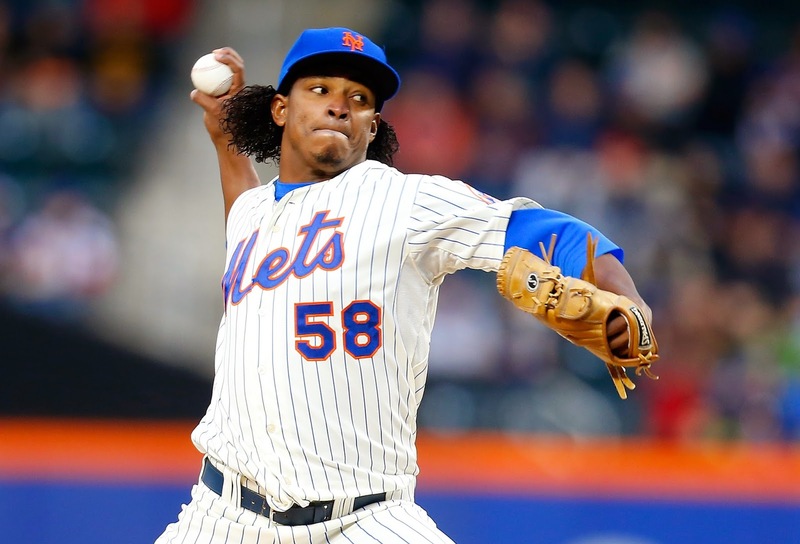 Quotes- NY Mets: “We were deeply disappointed to hear that Jenrry has again violated Major League Baseball's Joint Drug Prevention and Treatment Program. We fully support MLB's policy toward eliminating performance enhancing substances from the sport. As per the Joint Drug Program, we will have no further comment on this suspension." Jenrry Manuel Mejia was born on October 11th, 1989 in Tabara Arriba, Dominican Republic. At first he worked as a shoe shine boy, near the Santa Domingo air port, starting at age 11. He did not start playing baseball until he was 15 years old, realizing he could make a lot of money doing it. 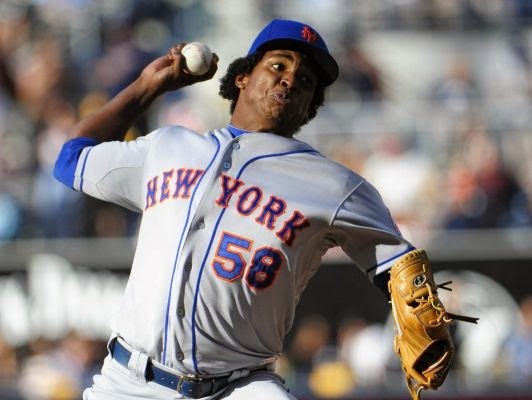 The six foot, right hander was signed by the New York Mets in 2007. In 2008 he went 2-0 with the Gulf Coast Mets pitching the league's only complete games shut out. He was promoted to A ball Brooklyn Cyclones where he went 3-2 holding the NY /Penn. League hitter to a .209 average against him (4th lowest in the league). In 2009 he went to St. Lucie & was an impressive 4-1 with a 1.97 ERA. He was promoted to the AA Binghamton Mets, where he was the youngest player at that level. He struggled going 0-5, then missed time with a strain in his finger. He was named to the Futures Game but missed out due to the injury. 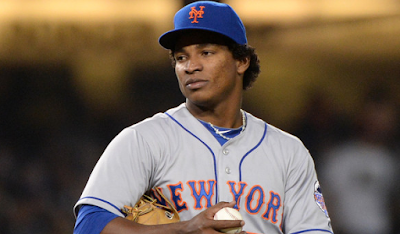 In 2010 he had a fine Spring Training & made the Mets bullpen roster going North. He was the youngest Met to start a season since Dwight Gooden in 1984, even though he had never won a game above the A ball level. He made his big league debut, relieving John Maine on April 7th, 2010, pitching two innings allowing a run in a 7-6 loss to the Florida Marlins. He would settle in to only allow one earned run over the next month, in a game he took his first loss in at Colorado. On May 9th, he blew a save opportunity when he served up a two run HR to the San Francisco Giants; Aaron Rowand. 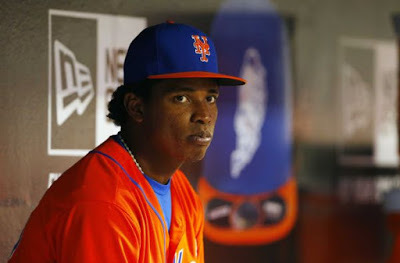 He was sent back to the minors in late June, bouncing around with four teams before returning to the Mets in September. He made his first career start on September 4th, with Mike Nickeas behind the plate making his MLB debut. The youngster lost two more decisions, ending his first season at 0-4 with a 4.62 ERA in 33 appearances. In 2011 he began the season at AA Buffalo & was ready to go back to New York, but then suffered a tear of his medial collateral ligament, which led to Dr. James Andrews performing Tommy John surgery. He returned to pitching in 2012, going through the ranks where he went 4-4 overall with a 3.59 ERA. Mejia made his return to the Mets on September 7th, 2012 finishing up a 3-0 loss to the Atlanta Braves. He threw two innings allowing a run, a hit & a walk. On September 15th, he got a start in Milwaukee against the Brewers were he gave up five runs on six hits in just three innings. 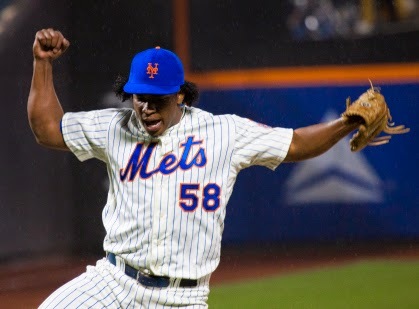 On September 24th, he pitched five scoreless innings at Citi Field earning his first win, beating the Pittsburgh Pirates. In five appearances he was 1-2 with a 5.62 ERA, striking out 8 batters & walking 9 in 16 innings. In 2013 he pitched in six games at various minor league levels, going 2-0 with a 0.82 ERA, at AA Binghamton during the summer & was ready. 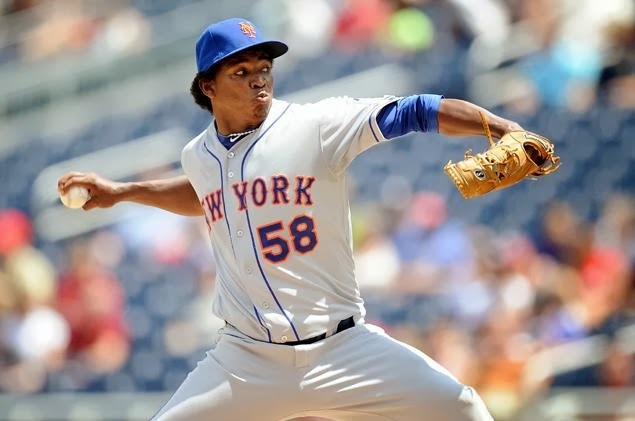 Mejia made his Mets 2013 debut on July 26th, in a start at Washington D.C. He pitched seven innings of shutout ball, striking out seven walking no one in the 11-0 win. He took a tough 3-2 loss to the Marlins; Henderson Alvarz, in Miami in his second start. On August 6th, he went into the 6th inning against the Colorado Rockies giving up just one run with seven strike outs, but earned a no decision in the 3-2 loss. On August 12th he allowed two earned runs in six innings to the red hot Dodgers in Los Angeles. But an unearned run was the difference as he took the loss to Ricky Nolasco. In a rotation of All Star starter Matt Harvey & rookie sensation Zack Wheeler, Mejia along with Jonathan Neise & Dillon Gee looked to be a fine starting staff. But then Mejia went down with injury, as he underwent surgery to remove bone spurs from his throwing elbow. In five games in 2013, he went 1-2 with a 2.30 ERA, 27 strike outs & just four walks in 27 innings of work. 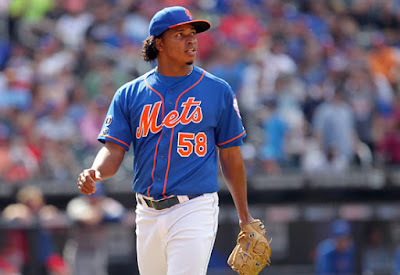 Mejia was ready & healthy by Spring Training 2014, he won out the 5th starter spot beating out Daisuke Matsuzaka & John Lannan. He had a great start to the season as a starter, on April 4th he allowed just one run on four hits in six innings beating the Cincinnati Reds. After a rough start to the Braves in Atlanta he won his next two games & was 3-0 with a 1.99 ERA. But then he struggled getting through the opposing line up after the second time around. He gave up six runs to the Miami Marlins & in his next start allowed eight runs to the Rockies in Colorado. In mid May he was moved to the bull pen to fine tune things up. At first he was not happy about the move but eventually adjusted into the role. After a late inning relief appearance in the May 12th subway series, in which he earned a win, he was 4-0. On May 17th he was used as a closer, earning his first save of the year, it came in Washington against the Nationals. 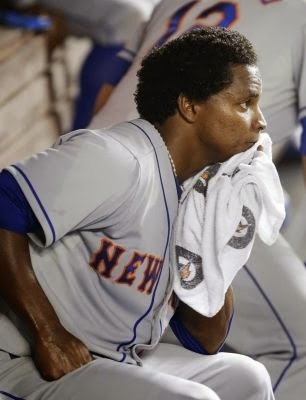 Mejia took over the closing role, as the Kyle Farnsworth & Jose Valverde experiments were both failures. Mejia took two losses in that month but also recorded five saves. By summer he was comfortable in the closing role & after every save began to show an emotional stomping celebration on the mound. Things went a bit too far when he made the last out in a game against the National & motioned to the hitter like he was reeling in a fish. At first Manager Terry Collins defended his pitcher as being very emotional, saying "I'm writing it off as an error of enthusiasm by a young player," . But soon after, he asked him to turn the celebration down a notch, to which he agreed. In July he blew one save but then saved eight straight games going into early August. On August 10th, he blew another save, allowing a tying run by Marlon Byrd & a walk off single to Ryan Howard. He also took two 9th inning losses at home, one to the San Francisco Giants & one to the Chicago Cubs. In both games he had entered to 1-1 ties. From August 26th he then saved nine straight games & his ERA which was over four began to lower. On the year he went 6-6 with 28 saves, finishing up 49 games (10th in the NL). He struck out 98 batters while walking 41 in 93.2 innings pitched. 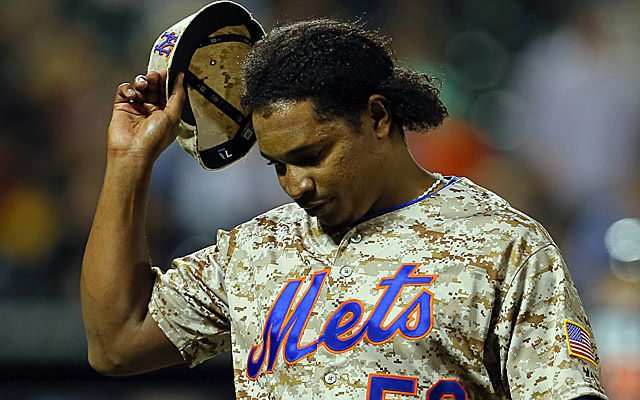 2015 was a disaster for Mejia, he started out the year penciled in as the teams closer. But on Opening Day he felt stiffness in his elbow which led to a trip to the DL. On April 11th he was found dirty for using a anabolic steroid, he received an 80 game suspension. By the time his suspension was through, Jeurys Familia had locked down the Mets closer role & the Mets were on their way to an NL Eastern title. 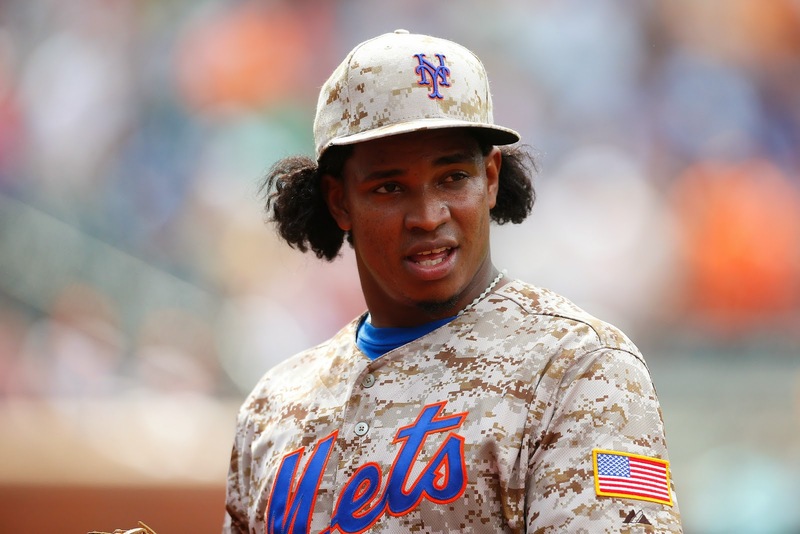 Mejia was looked at to be the set up man for Familia, but he quickly was found dirty again, getting suspended for another 162 games. This most likely ended the fools career with the Mets. In seven appearances he was 1-0 with a 0.00 ERA seven strike outs in seven innings. Mets Manager Terry Collins called it a "bad, bad decision on Jenrry's part. "(I am) extremely, extremely disappointed in what’s happened. This team’s had enough bad breaks and bad luck this year to last a long time." In February of 2016 he sealed his faith, failing the test for the third time, resulting in a permanent ban from baseball. He is allowed to apply for reinstatement after a year of the ban but must be out of MLB for at least two years if he is ever to be reinstated which is highly unlikely.